I absolutely loved your quote “Great passion has energy and is infectious”. Entrepreneurs are sometimes stereotyped for having great passion, but prone to frustration when they aren’t able to energise those around them. What advice can you give us on infecting others with passion? Being passionate is infectious and exciting not just for you but for those people around you. Being a successful entrepreneur is about much more than the fact that you’re passionate about something. I have seen many founders really passionate about what they want to do – we see many come into Shark Tank. The trick is to bring those in your world, and those who you are talking to, on your journey with you. If you are too scattered, too "blue sky", or too wrapped up in your passion that you forget your intention or your goal, then others will struggle to remain engaged and aligned with you. It is about passion coupled with purpose - and demonstrating that very clearly to those you speak to. You mentioned connectivity being the key for workplaces of the future. How do we manage the multi-generational workplace and educating from top-down the power of connectivity for business success? I actually wrote about this recently in a post inspired by the work that Redii is doing for workplaces. The challenge now with such diverse geographical locations being commonplace in the way teams are made up, is how to connect them all to a common purpose when they are in different time zones, in different offices, and may not have ever seen their colleagues face to face. At Redii, we believe it is so important to reflect on the present at all levels of the organisation. In that moment of success, in that moment of someone doing a good job (small or large scale) – it is so important to recognise that person and demonstrate to your entire team that they are valued and their work is a solid contribution to the business. This, of course, will have a positive effect on morale, but in turn financial success. After all, your people are your greatest asset. A strong support network makes us grow in our entrepreneurial pursuits. How did you establish your inspirational female connections with Janine Allis and Carolyn Creswell? We are going nowhere fast if we do not surround ourselves with instrumental, successful, wise, courageous and inspiring people. How can we expect to challenge ourselves to greatness if we are only seeking advice from ourselves? At the core of every entrepreneur is a network of greatness – whilst not called “Boards” they almost are just that. A number of trusted “advisors” we go to for help, advice, encouragement and sometimes even money. Janine and Carolyn are just two of these people...and I was fortunate enough to have spent the best part of three months filming Seasons 1 and 2 of Shark Tank with Janine, so we had lots of time to bounce ideas off each other. The key to having a strong network is to accept that you do not have all the answers...and learn to listen to the pearls of wisdom that others share with you along the way. Your wardrobe is fabulous! Can you share with us how many red pieces of clothing you actually own and which piece is your favourite? I couldn't possibly choose one! Let's just say that when I wake up every morning it is like putting on my uniform...when I am wearing red, it means I am working, I am on purpose...living what I love. As you can see, my wardrobe changes depending on what hat I am putting on - is it entrepreneur? Is it Shark? Is it RedBalloon or is it Redii? Either way I know when I walk out of the house I have a big game to play. Whoopi Goldberg and Ellen DeGeneres are two strong, driven and exceptional funny women who inspire you. 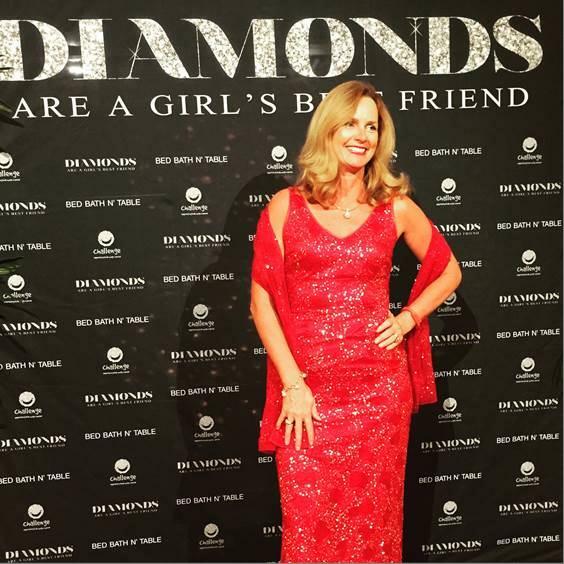 How has humour played a role in your success as Founder of Red Balloon and being a Mentor on Shark Tank? I often say that without a sense of humour and fun you can get too caught up in everything to remember you are human! In fact, it is one of the RedBalloon values that we look for in every new recruit, and recognise every day for within our business. There is a time to be serious, but that should not be what work is understood as...we spend so much of our life working either in or on businesses....and let's be honest, life would be simply boring if there was not some fun mixed in there. 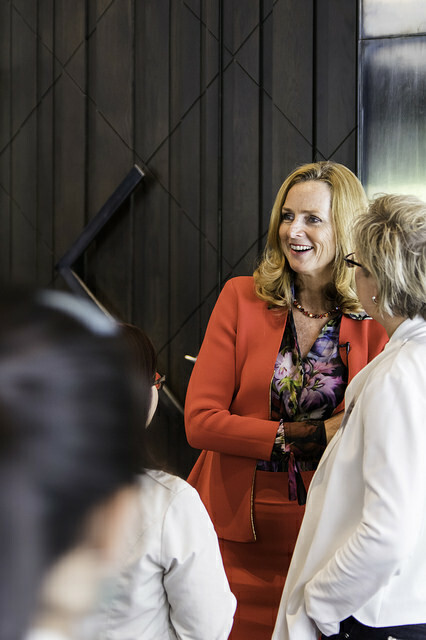 Naomi Simson (BCom 1984) recently spoke about the importance of a happy workplace at the Faculty of Business and Economics, 2016 Alumni Women’s Lunch. Read more here.